She gave birth to a small litter from the incident, the kits including Shizu, Rei and Akira. Aya tried to raise them, but their father forcefully took control and trained them to be fighters against her will. Aya was often gentle with her kits, but rarely had a chance to show it out of fear of Tsume. Shizu often would fail at his fathers' training, resulting in bad beatings and terrible mental abuse. During hunts, he wasn't very strong or useful. This got him only bare bones when it came to eat, which resulted in a lean body structure. Shizu was a quiet child, reluctant to hurt others and passively rebellious against his father. This only enraged Tsume, making him even harder on the young kit. He thought him weak and pathetic, often taking his frustration out on him and his mother. They were young still when their father went too far one day, beating Shizu within an inch of his life. Rei, often the one to protect his younger brother, stepped in, but his father threatened to kill him. Reluctantly, Rei stayed back. Aya jumped in, attacking Tsume and knocking him off of their kit. The male grew enraged, mercilessly assaulting the Espeon. It was a bitter and terrifying fight for the kits, and it ended with the Espeon laying in a bloody and unmoving mess. To 'teach a lesson' to their pack, Tsume defiled her body and left their mothers' corpse and Shizu to rot, ordering the whole pack to move. Shizu stayed with his mothers' body, only barely able to move on his own. As the days passed, he slowly recovered from his wounds, but began to starve without the pack to provide food. The kit was lost and in mourning, and refused to leave his mothers' side. He stayed nearby, only leaving her to drink water from a nearby stream. As the carrion creatures began to move in, he tried scaring them away, but with no success. They began to eat his mother as he watched on, in tears and helpless. Growing hungry over the long days, Shizu tried catching the carrion, but he was too weak from his wounds. Growing weaker by the day, the thought began to torment his starved mind, watching the others feed on her body. The young kit lasted weeks without eating, before he was eventually forced to eat the only thing he could; his own mother. Out of shame, despair and horror, he abandoned his mothers' corpse, disappearing into the Dark Caves. He had eventually began to call the caves his home, surviving off of the fish and animals that inhabited the dark caverns. As time saw him get older, he began to travel beyond the dark caves and later joined a trainer unofficially on their badge hunt. But as rumors began to spread about a sickness, there was an attack from a flock of Murkrow. A large Honchkrow plummeted out of the pitch sky. Shizu attacked this foul-smelling bird with everything he could, but the gigantic bird was too strong. Its' sharp talons dug into his exposed underbelly and forearms and its' large beak tore off pieces of flesh off his face. In one last effort, Shizu used Shadow Ball, blasting the Honchkrow and killing it. With their leader dead, the infected Murkrow sounded a retreat and left. The birds left the Eevee bloodied and shredded, as he lay dying in his trainers' arms. The young fox' face was torn and battered beyond repair, and his chest was badly wounded. The virus quickly took hold, leaving him to be cared for by his trainer night and day as he slowly slipped away. They did all they could to keep him alive, but it was no use. 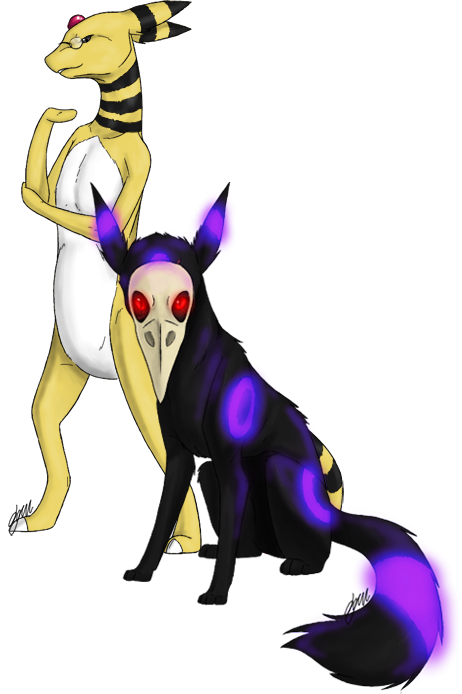 In the morning, through a strange mutation of the Eevees' DNA, the fox stood up weakly as an Umbreon with purple rings. His wounds were still present, but the virus that had crippled him mutated around his genes and became benign. As they stayed in the ruins to give him time to heal, he picked the bird skull clean and fashioned it over his head, wearing it to cover his mutilated face. Despite the treatment however, his face never was able to heal properly. His left eye is almost completely blind and bloodshot. The left side of his face is horribly disfigured. They continued to travel but soon parted ways as Plague began to deteriorate mentally. Appearance - he has scars on his belly that can only be seen when closely looked at, as they are under his fur. The fur on his arms never grew back, leaving only large scars and dark gray skin. - His face is badly scarred- the skin and fur never fully grew back correctly where the Honchkrow shredded his face. He doesn't usually take off his mask if he can help it, in fear of someone seeing him as a monster. User Notes - his ability Synchronize enables any dark pokemon to become invulnerable to the virus while in Plagues' company. - After Plague dons his skull mask, his trainer names him Plague, after the plague doctors of Europe. - Will often see flashbacks from his past, obvious signs of PTSD. The voice in his head is not a case of schizophrenia or DID, but his mind manifesting extreme guilt and pain through it. Pokédex Entry The tail's tip shines brightly and can be seen from far away. It acts as a beacon for lost people. History Kyoya was born into wealth. His father and mother were the prized champions of the elite beauty and breeding competitions that could be found globally, both of excellent blood, both bred to be the finest specimens of their species. 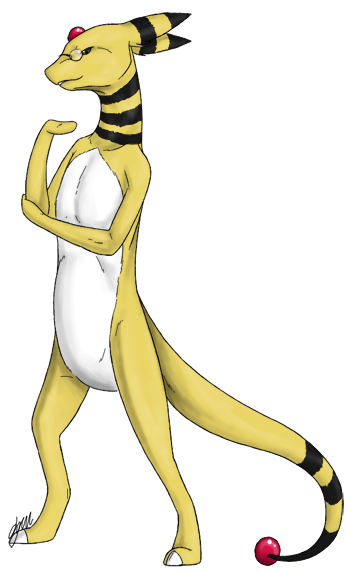 Being of the best blood, he was groomed very quickly to evolve, becoming an Ampharos within a matter of months. Kyoya was the youngest of his siblings, but was not favored by his parents or his owners. He was the black sheep, so to speak. Kyoya was not interested in breeding, nor was he interested in being beautiful, though he would easily be able to excel in both. He had often competed with other pokemon teams in battles of wit and resourcefulness, and in this, he truly was able to show his true colors. He trained groups of pokemon, analyzing their strengths and weaknesses with a tactical eye, regardless of their background or breeding, and made them work together seamlessly as a team. He was very talented in this, but neither his owners or his parents approved. They considered him a black stain on their reputation, especially after mingling with commoners! The family had tried numerous times to try and shame him and destroy his lifestyle, but each time he outsmarted them, all while shoving it in their face that he neither wanted nor cared for them. After a difficult and heated confrontation with the leader of the Ootoris, who considered Kyoya one of his sons, Kyoya stole his pokeball and crushed it. He wandered Johto, simply doing what he did best; improving himself by learning everything he could and using that to his advantage. When the epidemic hit, it changed alot of things. His tactics were excellent, but they could not hold up against the overwhelming numbers the undead had on their side. He underestimated their strength, and it cost him the team of wild pokemon he had joined. Of course, this couldn't have been foreseen, as this virus was more violent than anything the planet had ever seen before; but still he blamed it on himself. He convinced himself that he wasn't good enough. He retreated to the Ilex, where he had first met Plague, an infected Umbreon. He had found him in mental tatters, tearing himself up. From his purple coloration, he assumed he was an undead and tried to put him out of his misery. But when Plague didn't attack back and showed signs of cohesiveness, he stopped. Plague passed out from his exhaustion, and Kyoya brought him back to his den to bring him back to health. Once Plague recovered, they traveled together for a short while for what seemed like mutual benefit. The more time he spent with Plague, the more he realized that he was very different, and began to study him more intently every day, confirming his suspicions that the virus did different things to him, making him the first 'infected' to not be murderous and bloodthirsty. Appearance - He's very attractive and beautiful, due to his breeding. Personality - He's very cool and collected the majority of the time, but inside he can be screaming and raging. This comes from his strict upbringing. - He feels much differently than most people and has a heavy contempt for anything below a high intelligence. - He has a good head under pressure, and prefers to guide and command rather than fight himself. - Though he doesn't mind hanging out with 'common' Pokemon, he does still have a snooty side. - He is obsessed with excellence and intelligence, to the point of it being a flaw. User Notes - He can read human language, and is very learned from the time he spent at his owners' mansion and their extensive library.